Industrial Exhaust Fan that we offer is precision engineered to provide optimum air ventilation. It is fabricated using quality approved aluminum to anodized specification of JIS special grade H24. The best thing about our Industrial Exhaust Fan is that it is lubricated using Teflon that gives a smooth rotation for smooth functioning. 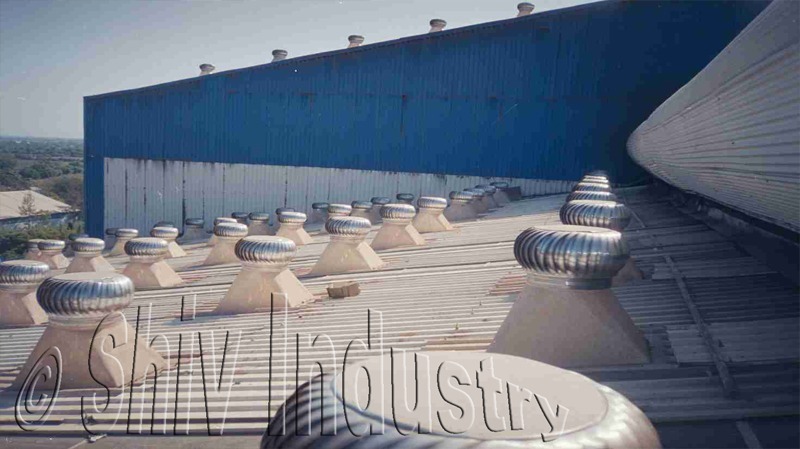 We make available Industrial Exhaust Fan in diverse sizes and other related specifications. Specialty Of Our Industrial exhausts fan : Corrosion resistant Light in weight Maintenance free Energy saving Noise free operation Provides efficient operation vent in a breeze of wind Benefits of Our Industrial exhausts fan Helps prolong life of insulation, shingles, roofing material and rafters. Energy free cooling, cuts on air conditioning cost, reduces winter moisture damage. Stainless Steel Shaft with Teflon self lubricated bearing for durability and friction free turning. Precision balanced and low inertia head design turns in the slightest breeze Attractive low profile design Ribbed design adds strength, high speed limiting device protects against high wind and to shed water. Availability: All size available as per Clint requirement with Ball bearing & Pin Shafting. Heavy structures have to be mounted on the roof. Not required heavy structures on roof. No maintenance costs as there are not armatures / field coils/switches.